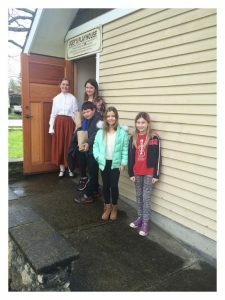 Looking for additional information about our school programs or how your program will work at Trethewey House Heritage Site? Our Frequently Asked Questions may have the answer! Still have questions? Please contact our Programs Manager at info@tretheweyhouse.ca. 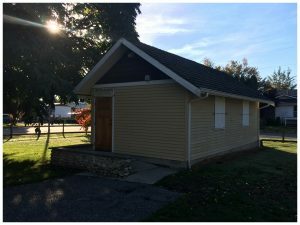 We are located near Mill Lake at 2313 Ware Street with access to the museum parking lot off of Alta Avenue. There is and yes, it is! If arriving by passenger vehicle, please park in the free museum parking lot off of Alta Avenue. If arriving by bus, please park the bus on the street and have your group walk through the parking lot to the Heritage Site. Where should we meet for the program? Please assemble all students and program participants on the cement pad between Trethewey House and the Heritage Gallery and ring the buzzer by the office door to let us know you have arrived. We request that teachers divide their students into two equal groups and ensure that there are enough chaperones for both groups. What if the number of students coming to the program changes? If the number of students attending the program changes before the booking date, please contact our Programs Manager at info@tretheweyhouse.ca or 604-853-0313. The final number of students will be confirmed onsite at Trethewey House before the start of the program. Payment for all students must be received before the start of the program. How many chaperones should my class/group have? We recommend that each school class has a minimum of four chaperones (two for each group once the class is divided in half) to a maximum of eight chaperones total for load capacity reasons. All chaperones are subject to the $5 tour fee. We tailor each tour to the age of the class group. For that reason, we do not permit any kids or siblings not enrolled in the class to accompany school tours. What if students need to leave the tour while it is underway? Can they rejoin? It is possible to leave the tour while it is in progress, but please note that anyone needing to step away from the group temporarily must be accompanied by a chaperone in order to be let back into Trethewey House as the building will be locked from the outside for security purposes. What other attractions are nearby that I can do with my class following the program? We are located next to the Mill Lake trail loop, which loops around the entirety of Mill Lake and around which there are playgrounds and a lot of local fauna and wildlife. We are neighbours with the Abbotsford Arts Council and are located a walking distance (1.0 km) away from the Gur Sikh Temple. The Reach Gallery Museum (2.7 km) and the Mennonite Heritage Museum (3.6 km) are also nearby. What if I have to reschedule or cancel my program? If you need to reschedule or cancel a program for any reason, please contact our Programs Manager at info@tretheweyhouse.ca or 604-853-0313. Please note that payments for cancelled programs will not be refunded.